A replenished stock of wardrobe basics beckons at the turn of any season, fall being no exception. Tailored blazers, smart slacks, cozy sweaters, cute ankle boots—the list goes on—and while we'd love to freely buy each and every single one of these laundry-list items from all of our favorite designers, we have to realistically draw the line somewhere. Whether it's allocating more budget to a classic designer item this year, like some gorgeous leather boots, and opting for more budget-friendly options things like a button-down shirt or a pencil skirt for the office, the key is in compromise. Thus, we sifted through our inventory of items we want to buy right now and landed on sunglasses as the category we could feasibly spend less on at the moment. Thankfully, once committing to this endeavor, we were delighted to find that there are actually plenty of affordable sunglasses available right now that not only feel relevant for 2018 but also don't look cheap—win, win! To see what we mean, scroll down for our edit of 20 sunnies for fall that all ring in under $50. White sunglasses still work for fall (and winter!). Embrace the futuristic trend with themed sunnies. 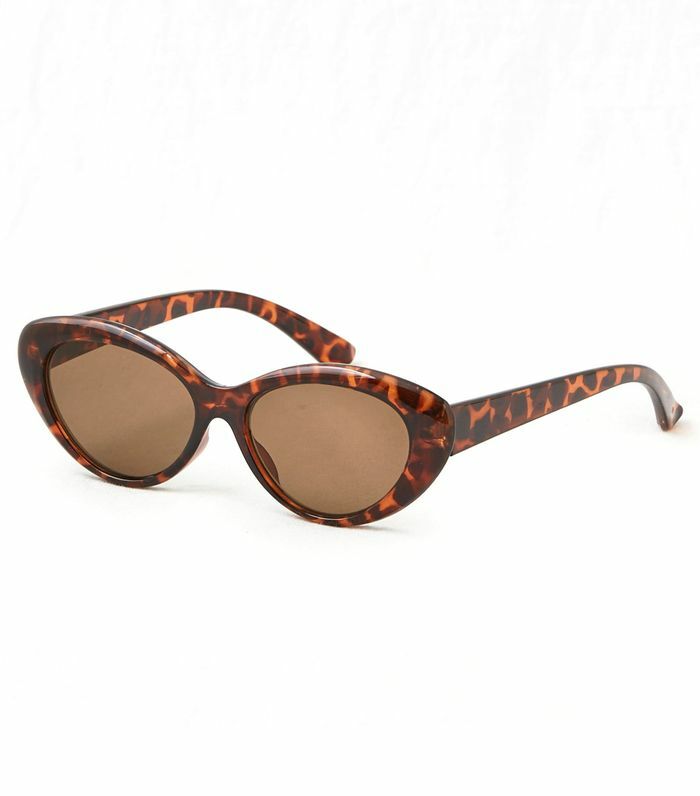 Some cute cat-eye sunnies should be in every girl's accessory closet. Try a sandy color for something unexpected. Wear these with your favorite knits and denim. Opt for something cool, like these metal-rim sunglasses. For a low-key pop of color. We love a see-through lens. Wear everywhere and all the time. For the shopper who likes larger frames. Make everyone green with envy with these adventurous sunnies. More proof that futuristic sunglasses are here to stay. A pretty shade of navy is a nice breather from your standard black pair. Give your look a touch of retro. Round frames always make a statement. We're intrigued by the cut lenses on this pair. Still looking for something? See more of the season's top sunglasses trends.